“Better than expected, and better than last year,” is how A+E’s Helen Jurado summarized the 5th edition of MIP Cancun, the recently concluded TV market focusing on LATAM, which was held November 14-16 at the Moon Palace Resort. 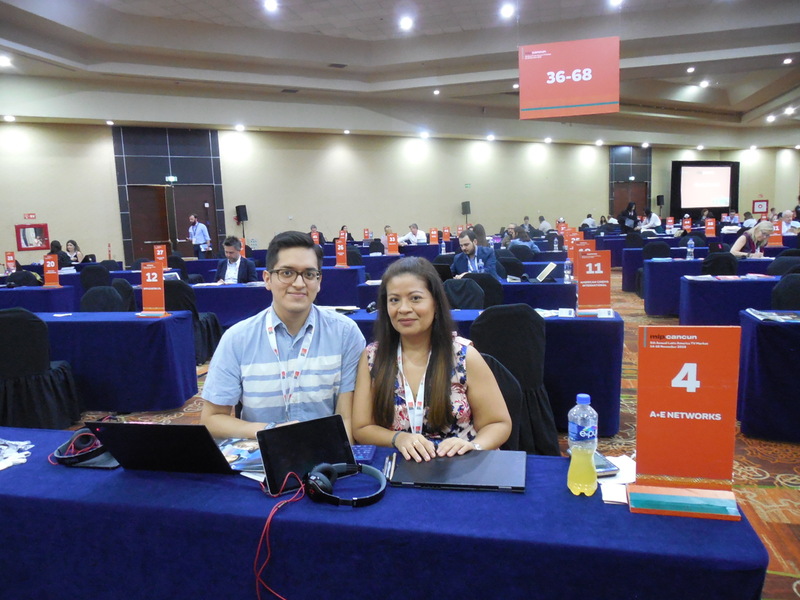 Jurado (pictured above with Jossie Capon) represented one of the 186 distribution companies that met up with some of the 186 buyers attending the Mexican market. This was a record-breaking year for organizer Reed MIDEM, to the point that the market cannot grow any further if more LATAM buyers aren’t found. “It’s really too big, compared to last year,” Jurado said. Indeed, Ted Baracos, director of MIP Cancun, acknowledged that, as far as distribution is concerned, MIP Cancun has now reached its plateau. “The market can grow according to the growth of buyers,” he said. Future growth, he added, will have to come from “Development and Co-producers,” which exhibited in the large hall of the Moon Palace (an area used by distributors last year; this year, they were moved to a larger hall on the second floor). Distributors took 206 tables and all were featured in a very useful 148-page guide that included photos and e-mail addresses of both buyers and sellers. However, the guide did not include the exhibitors’ meeting table numbers because the guide was printed before table numbers were assigned. For next year, Baracos accepted the suggestion to include table allocation information — even if it’s only in the form of photocopied flyers. About the persisting rumor that MIP Cancun could eventually move to Miami, RAI Com’s Bruce Rabinowitz pointed out that it is unlikely because buyers wouldn’t be subsidized in Miami since the market’s key financial supporters are TV Azteca and Pro Mexico, the country’s government trade organization. Other comments heard on the convention floor dealt with the perception that the Mexican market is not adversely affecting NATPE Miami because deals originating in Cancun need to be finalized in Miami. Plus, added Rabinowitz, on December 1, key personnel at government TV stations will change (due to changes with the new Mexican government), and the new ones will show up at NATPE Miami. A final comment came from first-timer John Cuddihy, who was representing Multicom, and said how pleasantly surprised he was at the market’s efficiency and effectiveness. “The timing is perfect since it allows for follow-ups at NATPE Miami,” he said. On the buyers’ side, South America was represented by nine countries, which constituted the largest contingent. Central America was represented by eight countries. North America was represented by all three countries, with the bulk of buyers coming from the U.S. (33) and Mexico (30). On the sellers’ side, of the 30 countries represented, the bulk was made up by the U.S. with 42 exhibitors, followed by the U.K. with 21 companies, then France (18), Canada and Spain (13 each). South Korea and Turkey each came with eight companies, as well. But the surprise presence came from companies that hailed from South Africa, Thailand, China, Japan, Finland, and Ireland. Among the LATAM companies, Mexico took the lion’s share with eight companies. In total, only 22 exhibitors came from LATAM. An extensive report of the MIP Cancun market will be featured in VideoAge‘s ATF (December) Issue.